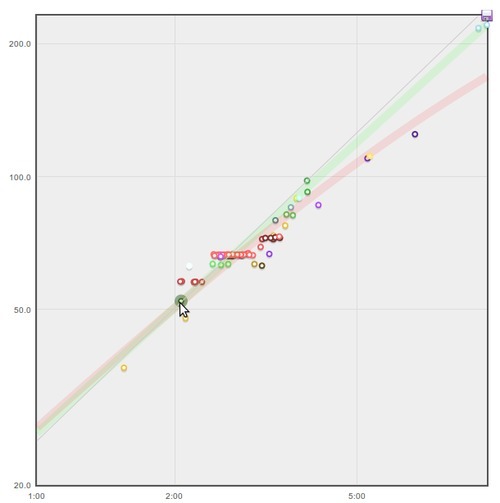 I've just added an experimental feature to GPSLog Labs to provide estimates of the finish times for different distances based on the activity you've logged. For example, this can take your pace from a 10km run and tell you how long it would take to do a half marathon, or take a target pace for a long distance and tell you how fast you should be aiming to do shorter training runs. This is based on formulas developed many years ago by Peter Riegel and Dave Cameron by fitting a curve to the world record times for various distances. How well these apply to non-elite athletes is something I'm curious about, but the theory is that if you put 100% into running 10km, you'll do it in a certain time. If you put 100% into running 5km, you'll be able to go a certain amount faster as you only have to last half as long and vice versa for 20km. The ratio of speeds at different distances should be roughly right even if you're not breaking world records. The estimates using the two formulas are quite close until you get to very large distances, but you will hopefully be able to judge which is more appropriate for your activity. The second version is found on the Distance vs Time Graph tabs of the Tag detail and Goal detail pages. 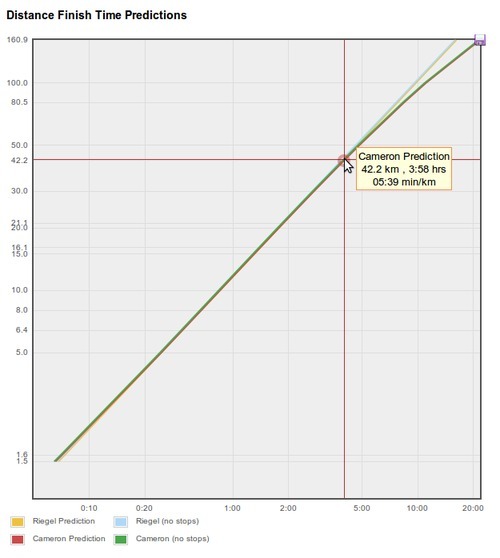 Move the mouse to set the speed to be extrapolated and the prediction curves will be overlayed on your actual recorded activity to see how they compare. The thin gray line is a linear prediction assuming your speed/pace won't vary as the distance increases or decreases. The red line uses Peter Riegel's model and the green line uses Dave Cameron's model. These estimates are often very similar and overlap simply appearing gray. As far as I know, these formulas were developed for running, but the curves may be useful for other activity as well. I'm very interested in knowing how this works for people, there are many other sites on the internet that will perform the same extrapolations if you manually key in your distance and time, so it's not just me interested in playing with this stuff!